A brace of early Topps wrapper and Bazooka comic uncut sheets popped up unexpectedly last fall, originating from the printer, although via a third party that did not know the name of the firm-drats! 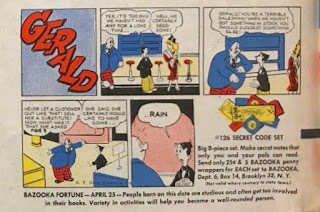 They have scattered a bit to the wind, some to places unknown and some known-one even landed here at the Main Topps Archives Research Complex. As such, a review of some of the more interesting pieces can be conducted. 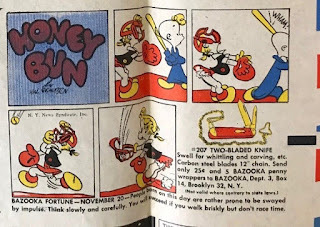 The most compelling ones featured uncut one cent comics, some are pre-Bazooka Joe, others have the ubiquitous, eye-patched mascot of Topps featured. 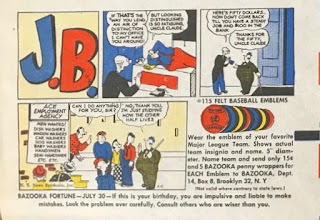 The earliest of these looks to be in the 1953-54 range and the entire collection of sheets, numbering a half dozen or so, date from this time through about 1957. 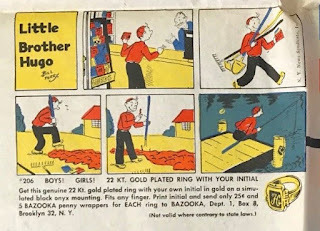 This one, alas, did not make it here and ended up somewhere I do not have access to unfortunately. The sheets all appear to be missing the final wax coating and are a bit fragile but they are not falling apart, like I've seen some old paper items do. 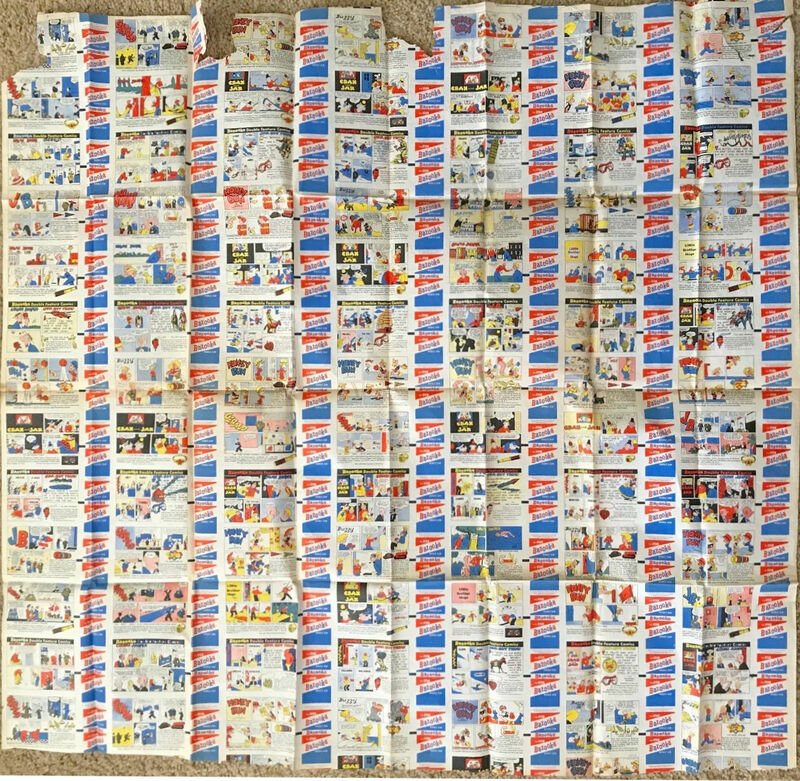 You can see how the outer and inner wrappers were sliced and diced from the same sheet. Excluding the very tippy-top row, which is almost all cut off, I've started my matrix at the first full (sorta) row, which I am calling "A". 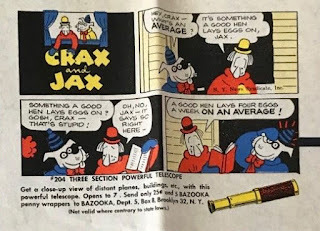 The rows with black bars atop each comic all contain Double Feature Comics and they repeat every third row, so C, F, I, and L are all Double Features. 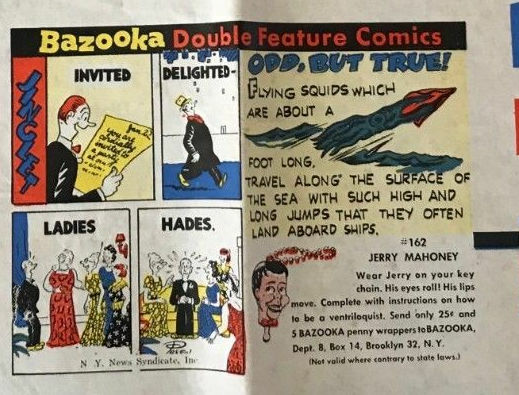 Topps also did this a half decade later with Bazooka Joe's (not Double Features but black barred comics). The pattern then picks up at A again. 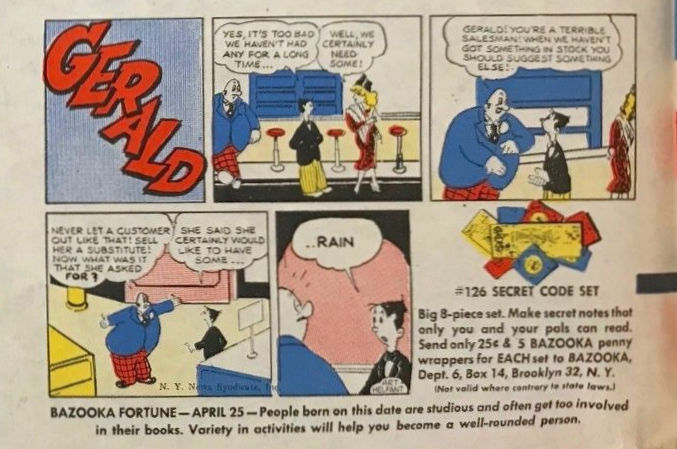 There are 7 columns with edges on either side looking straight cut so there are 84 unique comics to the set. 56 singles and 28 Double Features. 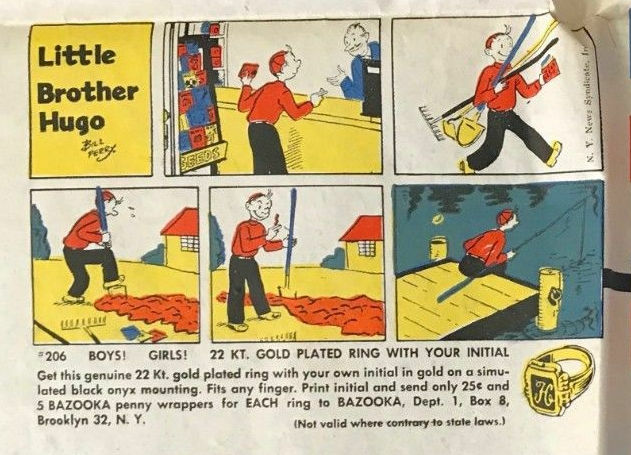 I believe these date from late 1953 into early 1954 and are the last series printed without any Bazooka Joes. Some of the jokes would have "worked" no matter what strip they were in, don't you think? 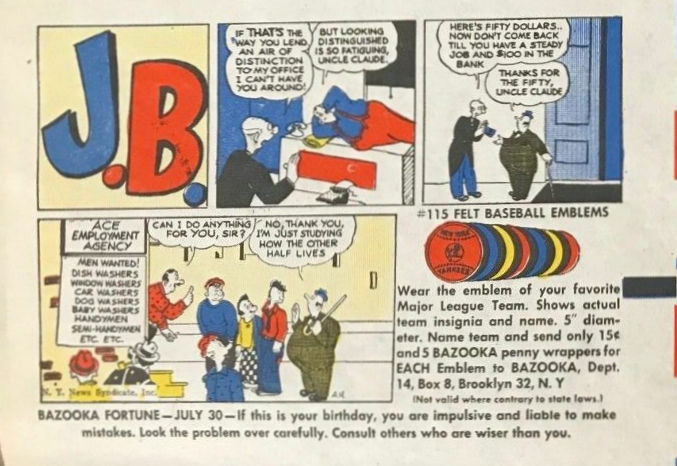 And isn't it interesting how long those felt baseball patches have been around? Next time out we'll take a peek at a very interesting sheet of Bazooka Joe and his Gang!